Skiing and snowboarding are thrilling and challenging, but for every jump, turn, and feature you’ll find on the slopes there are just as many spectacular sights and incredible natural wonders on a good hike. Of course, when you’re hiking at Mammoth’s elevation hiking is plenty challenging too. 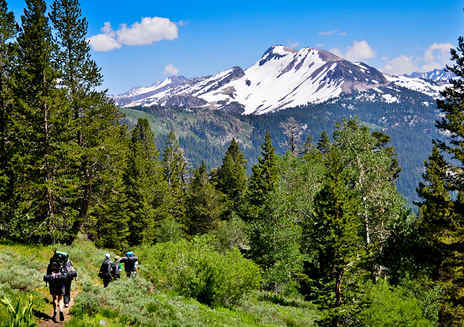 Spring hiking is the best way to leave winter behind and enjoy the warmer weather, and when you’re in Mammoth Lakes you have the perfect trails and landscape to do so. Whether you’re hiking in search of blooming wildflowers or looking to cure your winter cabin fever with a heavy dose of the great outdoors, check out ASO Mammoth’s list of the best spring hikes near Mammoth Lakes. If you’re in need of any gear or advice on where to hike, stop by ASO Mammoth on your way to the trailhead! Don’t be put off by the fact that McGee Pass is a 14.3-mile hike. There is enough beauty all along the trail for hikes of all distances to be rewarding. The McGee Pass trail begins at the end of McGee Creek Road when the road stops and the creek it is named after begins. Once you step foot on the trail, you’ll walk parallel to McGee Creek walk further up into the high meadows bordered by the mountains. If you’re hiking McGee Pass in the spring, be aware that snowmelt could cause the creek to rise. Be cautious of all trail crossings that are flooded and also consider that the trail rises into high elevations. Sherwin Lakes is a more approachable hike than McGee Pass, but that doesn’t mean it lacks any of the spring beauty. Although the hike to Sherwin Lakes is only 4.5 miles, it does climb quickly through a steep trail and several switchbacks. Still, the climb is worthwhile to see wildflowers thriving at the lower elevation next to the stunning lakes in the area with snowcapped mountains on the horizon. If long or steep trails are not for you, then check out Convict Lake. The Convict Lake trail circles the lake it is named after for only 2 miles, but once you see the mountain peaks and wildflowers running up their sides, you’ll wish it was longer. Before you visit Convict Lake, take a moment to learn about the history of the area and how the lake earned its name for a fascinating trip! For a trail to be only 0.6 miles long and still be as popular as Agnew Meadows Wildflower Loop, you know it has to be special. As the name suggests the loop is an easy journey through Agnew Meadows where a wide variety of wildflowers bloom in late spring and early summer. Thanks to the short length and easy path, Agnew Meadows Wildflower Loop is the most accessible hike on this list. Although Sky Meadows’ wildflowers peak well into the summer, the experience of hiking a beautiful trail just outside of Mammoth Lakes is too good to pass up. The Sky Meadows trail is 4.2 miles long and climbs over 900 feet, so be prepared for hiking at elevation if you visit. The hike is absolutely worth the climb into the meadows though, especially when the warm weather has had a chance to let the flowers bloom. Be warned though, warm weather and water make for mosquitoes, and Sky Meadows is no exception! Before you walk out the door for one of these trails, always check the status of the trail and the weather, and bring plenty of water. Lastly, do you best to stay on the trail and to keep from stepping or laying on any wildflowers!